The end of July signals a big event in our home. It marks the middle of summer of vacation and elicits excitement, joy and sometimes, tears when the Barnstable County Fair is set up for a week at the edge of town. The barren land of the dry, dusty fairground becomes alive with the Zipper, Ferris wheel, fun houses, games with loud hawkers trying to get anyone to play for a huge stuffed animal and most often, lose. Carnival treats: cotton candy, fried dough, Dell's Lemonade, ice cream sundaes, pulled pork, fried chicken and french fries. Vendors show off everything from handmade silver jewelry to hot tubs and vacuum cleaners. Livestock barns filled with cows, horses, hatching baby chicks, rabbits and exotic petting zoos. Even live acts of has-been or up-and-coming singers and bands entertain the crowds. But none of that is on my kids' minds. They are ready for competition. Adult and youth exhibits of amateur artwork, gardening, cooking, needlepoint even 4-H and science are set up in the halls just inside the main gate. This is where the action really happens. Ava and Declan allow me to bring in a few pieces they make in art class through out the year and Declan may decide to build a project out of Legos but where the kids really want to shine is in the baking department. And it can get ugly in our kitchen. I know I have myself to blame. I am the one who can't wait to bake something I deem to be spectacular and enter in the Adult exhibit, hoping for a top prize of my own. Val is the queen of blue ribbons, state awards and Best in Show prizes for everything from her homemade sliced white bread to expertly knit baby blankets and garden grown raspberries the size of a giant's thumb. So, I thought it would be fun to get my children involved. These two are close in age, going head to head in the same group. Their competitive natures rival Larry Bird and Magic Johnson, Superman and Lex Luthor. And this year,they both wanted to make cupcakes. This is understandable as Ava, last year, created a cupcake that Hostess would be proud to market. The silky frosting, creamy filling and devil's food cake won her not only a blue ribbon but also a Best in Show for the kids' baking category. No small feat. We were all very proud. Ava was elated. She had not only beaten the competition but best of all, she blew her little brother's entry out of the water. But this year, Declan had his heart set on such a prize. I was fearful for him to go up against the cupcake champ. But he kept insisting. He wanted to make a cupcake with a toasted marshmallow on top. I did not think it was worthy of top prize. Ava wanted to make a chocolate cupcake that had M&M's hidden inside. The candy spilled out after the first bite much like a pinata after being hit hard enough and breaks open. This sweet treat, topped with fluffy buttercream and a sprinkling of M&M's was sure to garner praise. But a cupcake with just a marshmallow on top? Declan was sure to be disappointed and I did not want to deal with the moodiness and potential tears. He was not convinced when I suggested a brownie entry. Not just any brownie, something fancy. Like Rocky Road, studded with chocolate chips and mini marshmallows. The judges would surely think it was a hit. Declan was not convinced. He wanted a huge marshmallow toasted on top. This was his vision. He wasn't about to budge. We compromised. A brownie with graham cracker crumbs on top and, O.K. a huge toasted marshmallow on each square. We tested it out. They looked and tasted pretty good. I was just glad he would not be in direct competition with his 13 year old sister who is becoming quite a baker. On the first night of the fair, we did our usual routine. Straight through the main gate to the exhibitor halls to check to see if anyone won anything. Then off to a dinner of way to much junk food and lots of rides to work off our meal. I tried to pace the kids to look at all the artwork as they became excited over a red ribbon for Declan's Lego fidget spinner and Ava's blue for her clay birdhouse. But they ran ahead over to the baked goods display. I wanted to be the buffer, just in case of disappointment. I really wanted to avoid the whole thing all together. It's hard to be exited for a winner and console the one who fell short, when they are both your children. Shocked and excited, the kids both won blue ribbons for their individual categories. As their mother I was relieved that no one would be mad or sad while we spent a night at the fair. But wait, I felt this wave of relief to soon. Ava had the look on her face that only comes from being angry at her younger brother. 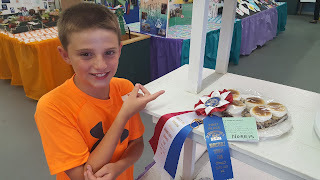 My eyes followed her icy stare and landed on Declan's beaming face as he pointed to the large, red, white and blue ribbon for his marshmallow topped brownies: Best in Show. Grease an 8x8 pan and sprinkle 1/2 of the crushed graham crackers as if flouring the pan. Reserve the rest of the graham crackers for the topping. Melt butter in a medium sized sauce pan. Remove from heat. Add sugar, eggs and vanilla. Beat to combine. Add cocoa, flour, salt and baking powder. Mix well. Pour batter over crumbs in pan. Top batter with remaining graham cracker crumbs. Bake for 25-30 minutes. Do not over bake. Cool completely. Cut brownies into desired serving size. Place each brownie on a lined baking sheet. 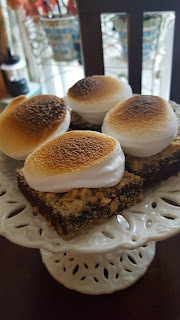 Cut each marshmallow in half horizontally and place 1/2 on each brownie with the sticky side down. Place brownies under broiler for 3-5 minutes until marshmallows are golden brown. Cool and serve. Enjoy! Make the Cupcakes: Preheat oven to 350 degrees F. Line a standard 12-cup muffin tin with paper or foil liners. Place the chocolate and cocoa in a medium bowl. Pour the coffee over the mixture and let sit, covered, for 5 minutes. Whisk the mixture gently until smooth, then transfer to the refrigerator to cool completely, about 20 minutes. Whisk together the flour, sugar, baking soda and salt in a medium bowl. Divide the batter evenly among the muffin cups. Bake cupcakes until set and just firm to the touch, 15-20 minutes. Let the cupcakes cool in the tin on a wire rack until cool enough to handle, about 10 minutes. Remove each cupcake from the tin, set on the wire rack, and let cool completely before filling and frosting, about 1 hour. Assemble the Cupcakes: Using a small, sharp knife, cut the centers out of the cooled cupcakes, going about two-thirds of the way down. Save the part you cut out. Fill the cut-out insides with mini M&Ms. When filled, the M&Ms should almost reach the top of the cupcake. Once all the cupcakes have been filled, slice off the smooth top of the piece you cut out. Replace the smooth top over the M&Ms. Make the Buttercream: Use an electric mixer to beat together the butter, powdered sugar, salt, vanilla, and milk and Crisco. After filling the cupcakes, Use a frosting knife, spread a good amount of frosting on top of the cupcakes, being careful not to move the removed cupcake top around. No need to let the frosting set, but any cupcakes not being eaten right away should be stored in an airtight container, and if it's the summertime, in the refrigerator.